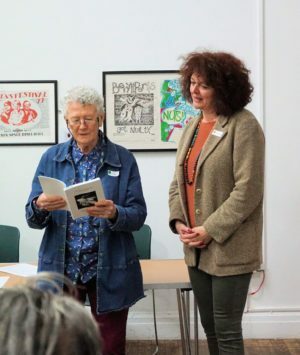 The BHS is the sponsor and organizer of an International Haiku Conference which will take place at the Maltings Arts Theatre in St Albans, UK on the weekend of Friday, 31 May to Sunday – 2 June 2019. The overall theme of the conference is ‘Haiku Crossing Cultures, Harmony within Diversity’. 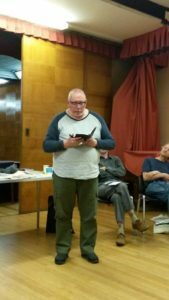 Shared readings from ‘where silence becomes song’, the conference anthology. There will be a farewell meal in a local Turkish restaurant for anyone who is able to stay for the afternoon (the cost of the meal is not covered by the conference fee). We are also producing a conference anthology called ‘where silence becomes song’. 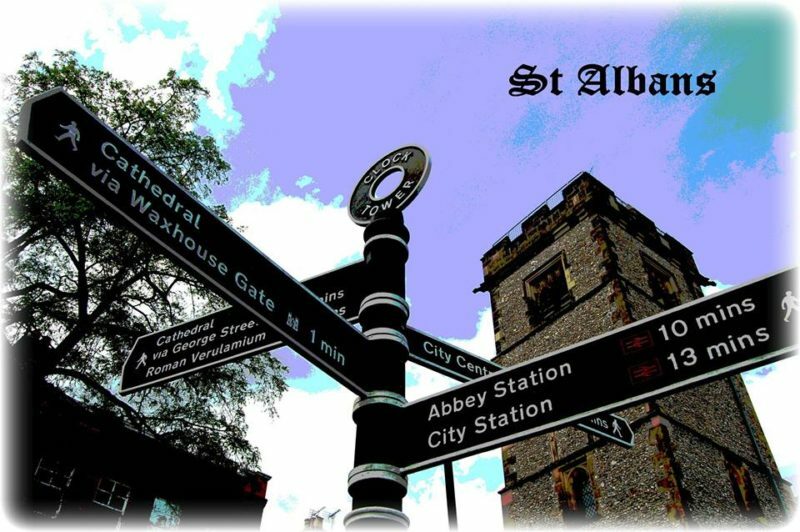 The anthology will be launched at the reception on the opening night. During the conference a bookshop will give the participants the opportunity not only to sell their own books/booklets but also to get acquainted with publications from other haiku poets. David Bingham and I spent two wonderful days in Sofia with our good friend and guide Iliyana Stoyanova. After a two hour and forty-five-minute flight from Gatwick, we arrived in snowy Sofia at midday on 17 December 2018. Iliyana was there to welcome us. After settling in our hotel, we had lunch, and started a tour of this beautiful city. Over the next two days we visited The St. Alexander Nevsky Cathedral (one of the largest Eastern Orthodox Cathedrals in the world) and the The Museum of Christian Art, housed in its crypt; the National Ethnographic Museum; Sofia City Art Gallery and many other places of interest. 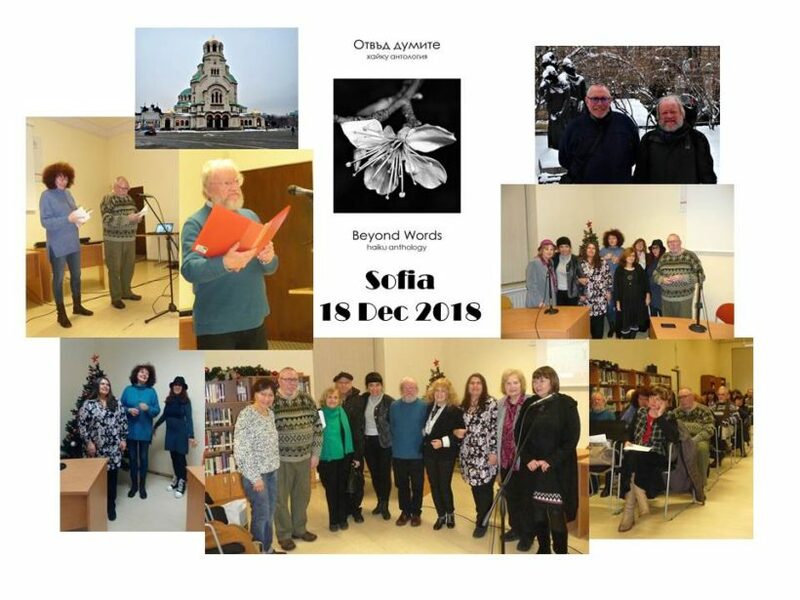 On the evening of 18 December, we attended the launch of the Bulgarian/English collaborative haiku anthology, ‘Beyond Words/Отвъд думите’. We were warmly welcomed at the American Center at the Sofia City Library by our Bulgarian haiku hosts and were kindly given, much to my surprise, many gifts. About forty-five people attended this event. The evening started at 6pm and was split in two halves. The first half of the proceedings consisted of our hosts voicing a welcome to those present. Then there was a 4-part recital from the anthology; and two singers Alexandra Ivoylova and Dilyana Georgieva entertained us with their fine voices. which to me summed up the effort she had put into this project over a long period. Overall, a wonderful evening, which I will never forget. A big thank you to our hosts, the Bulgarian Haiku Union, the Haiku Club – Plovdiv and the other poets, their representatives Sofia Philipova, Zornitza Harizanova, Ivanka Yankova and Vessislava Savova for their splendid welcome and kind words. I truly believe that haiku can bring people together in the most amazing and positive way. BHS is in very good financial shape and membership is the highest ever, 379 people. This is mainly due to social media and the BHS website. The BHS Facebook group has 1278 members and the BHS page has 2069 likes. The Society is now fully compliant with the new 2018 Data Protection legislation. 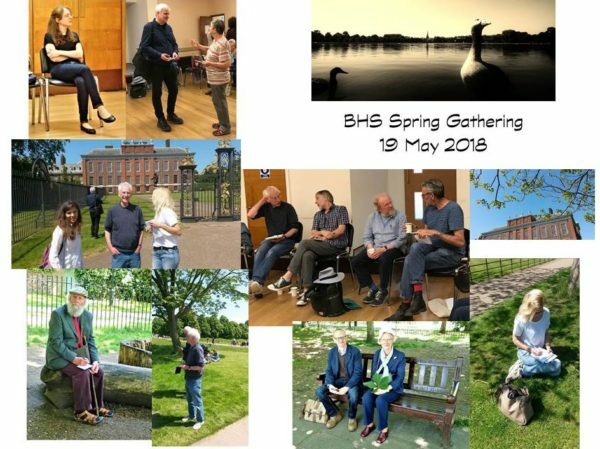 Outreach and links to other societies included: London/South East regional group meeting by The National Poetry Library as a regular venue and liaising with Andy Bungay of Wandsworth Radio to promote haiku and the BHS. 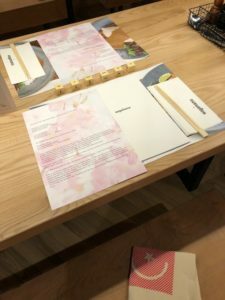 Wagamama haiku workshops in Liverpool, Chelmsford and London. Collaboration with Bulgarian haiku societies, contact with the UHTS (United Haiku and Tanka Society) and Blithe Spirit articles featuring poets of the Polish Haiku Association and the African haiku network. The sound of haiku in Bulgarian was introduced by Iliyana Stoyanova. 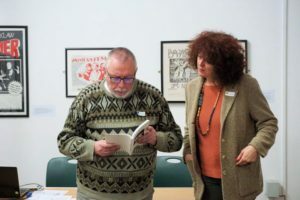 Members read works which appeared in Beyond Words, a Bulgarian-English anthology published this year by the Bulgarian Haiku Union and Haiku Club Plovdiv with some sponsorship by BHS. Iliyana re-read the same pieces in Bulgarian, a demonstration of how one language can take more – or fewer – words and syllables to express the same poem. At the end of the day came a Haiku Train conducted by Iliyana. Haiku trains are a form of renshi – a modern development of renga and renku with participants in small groups writing collaborative poetry. From the starts of two different haiku many different ‘trains’ resulted. A word from the final line in each haiku – or several words or the whole line – must be in the first line of the next haiku. Spot the links in this one from Team Squash: David Bingham, Kate B Hall, Sarah Lawson, Sprite. 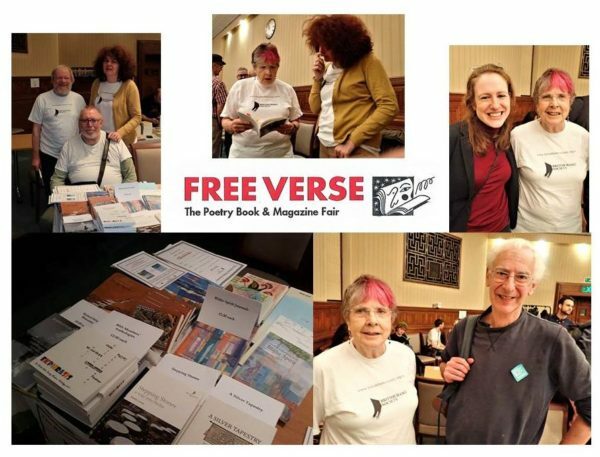 As part of the BHS on-going outreach programme, and for the 4th year running we had a table at the new venue, Senate House, London, of ‘Free Verse, The Poetry Book & Magazine Fair ‘, run by the ‘Poetry Society’, and organised by Julie Bird. Senate House is a brilliant venue, and it attracted a lot people, even though it was a rainy day. In total we made £80.00 from the sale of books, which was nearly double what we made last year. We met some brilliant people and hopefully made some converts to haiku. 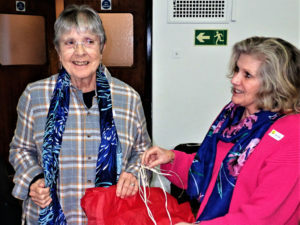 Our BHS member from USA Robin Smith came especially to meet us during her stay in London. Helpers on the day were Kate B. Hall, Iliyana Stoyanova, Debbi Antebi, David Bingham, David Jacobs and Frank Williams. Above are a few photos from the day. 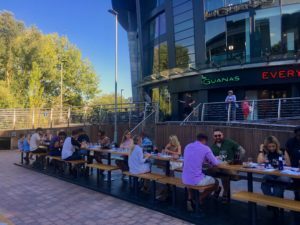 This summer, the British Haiku Society was approached by Wagamama to assist them with a series of restaurant openings across England. 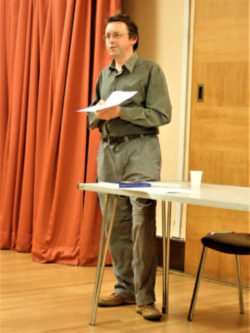 As a new and eager member, I volunteered to help with the Chelmsford branch and, some weeks later during the height of the heat wave, found myself on the train to a city I had never been to, to teach total strangers about the marvelous and mysterious form that is haiku. The Wagamama marketing team were very helpful in the fortnight leading up to the event and gave me a generous budget from which to provide haiku entertainments and draw a fee. We decided that as it was to be an outdoors event, with diners turning up at different times, it would be best if I could run a haiku contest, whilst walking around to chat informally about haiku with the visitors individually as they waited for their dishes to arrive. 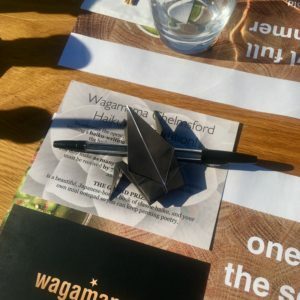 With this in mind, I turned up early and brought decorations of origami cranes in the Wagamama colours of black, white and orange to set at each place on the table alongside a haiku competition entry form and a biro. I had a table to one side (next to a very charming sake stand) and covered it with more entry forms, some beginners’ haiku guides I had written and printed, and of course the grand prize: a copy of Haiku: Classic Japanese Short Poems published by Amber Books, a mini notebook and pen, and a Wagamama tote bag. As I wandered around and talked to people about haiku, I was amazed by the enthusiasm with which they greeted me. Everyone was friendly and incredibly eager to learn about and write haiku, particularly the children, who encouragingly had all been learning about them at school. It made my job very easy: the hard part was judging so many fabulous entries. In the end the prize went to a lovely family, who had between three of them submitted over twelve excellent haiku! 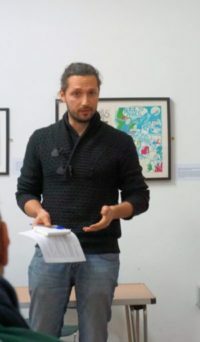 I feel very lucky to have had the opportunity to help with this event and am immensely grateful to both the British Haiku Society and Wagamama for making it happen and welcoming me on board. 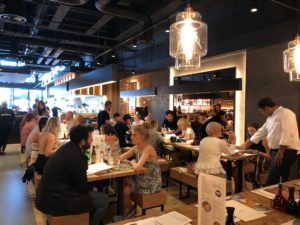 I was very kindly invited by The British Haiku Society to attend the opening evening event at Wagamama, a Japanese influenced restaurant in Liverpool. As soon as I entered Wagamama I knew I had entered an oasis of calm and tranquility with a distinct Zen like quality of flow. I felt immediately that haiku had a home here. The restaurant was soon filled with people eager to taste the Japanese inspired food and at the same time experience for themselves the concept of haiku and how integrated it is into Japanese culture. The guests were given a selection of Haiku Cubes which act as a medium of inspiration in creating their own unique poem. Alongside this was cherry blossom paper with 2 examples of haiku written by one of Japan’s most prolific Haiku Master’s Matsuo Basho. Together with 2 haiku written in the 21st century. It made for some great inspiration and anticipation at the chance to create live haiku on the night. This was followed by my talk about haiku – it’s origins, form and influence in society back in the 17th century and in the 21st century. And also a little bit about Basho and how integral he was to both the expansion and awareness of haiku in the Japanese culture. The guests were then presented with the most delicious food which I can only describe as nothing less than works of Art! And the Head Chef visited each table and gave a talk on the food, it’s flavours alongside its Japanese influence. In-between Mains and Deserts every one got busy writing Haiku! And I have to say the Haiku produced was of such a high standard, some of which were a strict 17 syllabic count which was very impressive. There was a chosen winner and a prize of a haiku collection book was given. 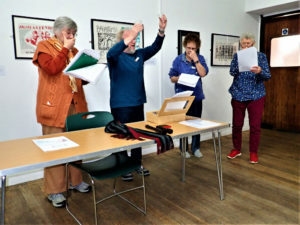 It was wonderful to see how a form of poetry from many centuries ago had traveled from Japan to Liverpool into the 21st Century and maintained its ability to reconnect “Self with self” and connect people to each other. 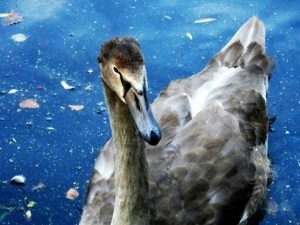 It restored my faith in the power and ability of words to heal the world haiku by haiku. In the morning session led by Debbi Antebi, participants wrote haiku on the theme of ‘spring gathering’. There were many different perspectives and approaches to the same theme, as will be seen from the examples below. 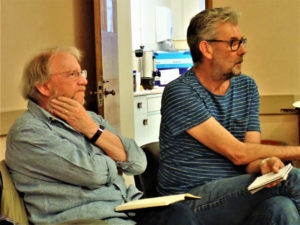 This session was led by Mark Gilbert, who informed us about a relatively new form of haiku/senryu in which one line (or part of a one-line poem) consists of the name of a person who is alive, dead, real or fictional. Some examples of the form were shared, and participants were asked to try their hand at writing whoku. We were fortunate to have a sunny afternoon for the ginko in Hyde Park, which was led by Alan Summers. Upon our return, we shared the haiku that had been produced and held a haiku contest (kukai). The winner of the contest was Frank Williams, who received a haiku book prize. The day finished with a haibun activity led by David Bingham, who discussed different ways in which haibun may be written and shared strategies for crafting strong pieces. Participants were then asked to write their own haibun based on their ginko experience and to share their writing within their groups. Overall, it was a great day filled with haikai activities, and the feedback received from the participants was very positive. 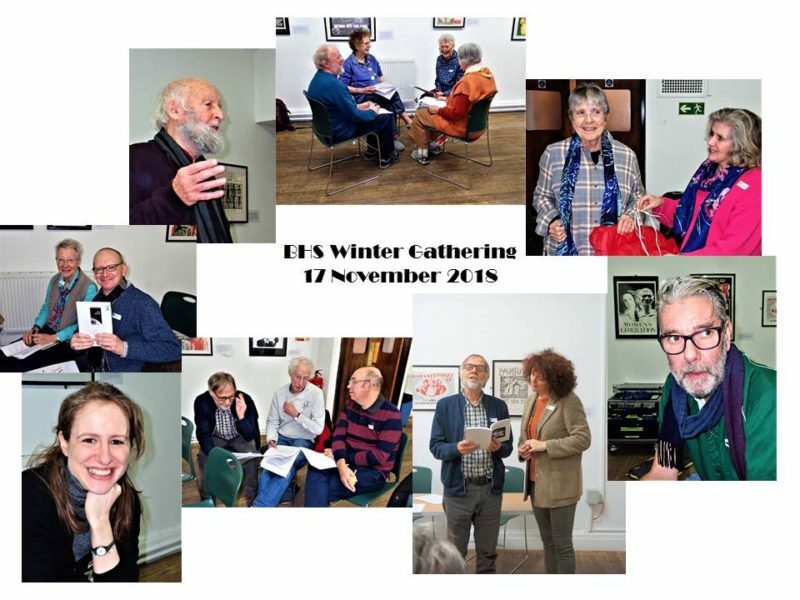 On Saturday 2 December 2017 nearly 30 BHS members met for the BHS Winter Gathering and AGM at the Conway Hall, Red Lion Square, London. 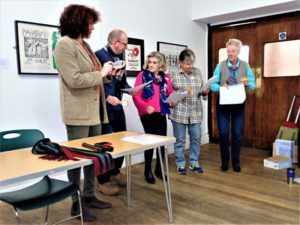 In the morning we had the AGM and a wonderful workshop led by Diana Webb – Having Fun with Haibun: matching haiku with the haibun prose and writing haibun in groups inspired by “Balloon Girl”(2002) – a mural by graffiti artist Banksy. Letting go of her childhood. The weeds at her ankles. Signed by the artist in colour on the grey wall. The wind in her outstretched hand. Both the child and the wall keeping their innocence. 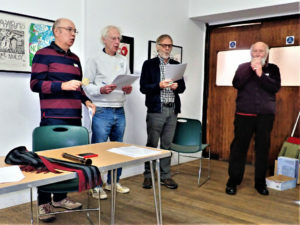 In the afternoon we enjoyed a haiku performance by the Green Wood Haiku Group – haiku and haibun reading, accompanied by shakuhachi music and singing, a sequence of urban haiku performed in an experimental way, and an audio visual display. 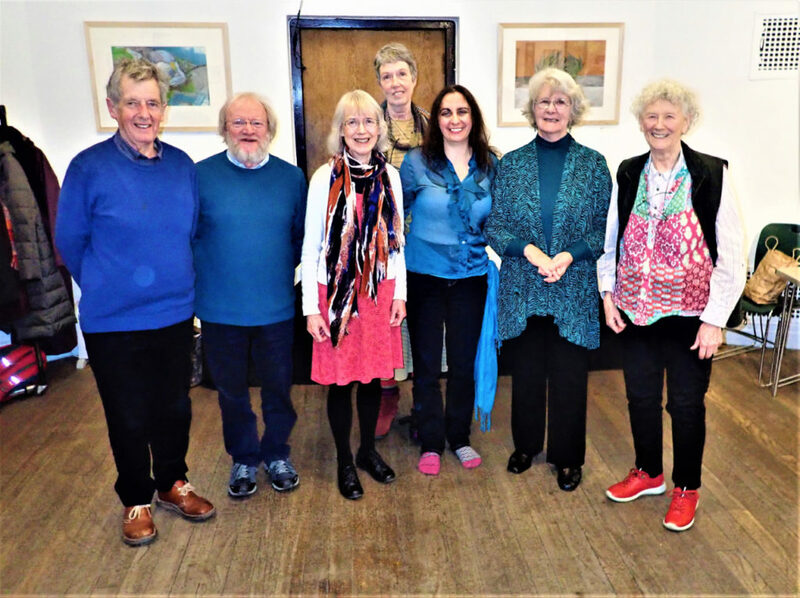 The members of the Green Wood Haiku Group who wrote material and took part were: Martin White, Sue Richards, Lizzie Prudence, Norma Gregson, Sandra Goodfellow, Ann Turnbull, Bethany Rivers, Catherine Redfern, and David Bingham. Afterwards we had a structured discussion about the techniques which can be used when performing haiku. 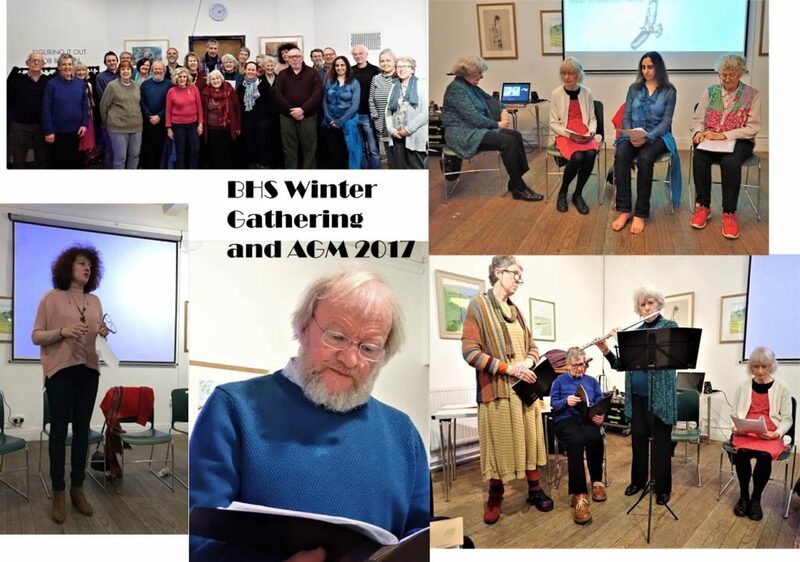 So all in all we had quite a lively and informative gathering and we are looking forward to the next year! 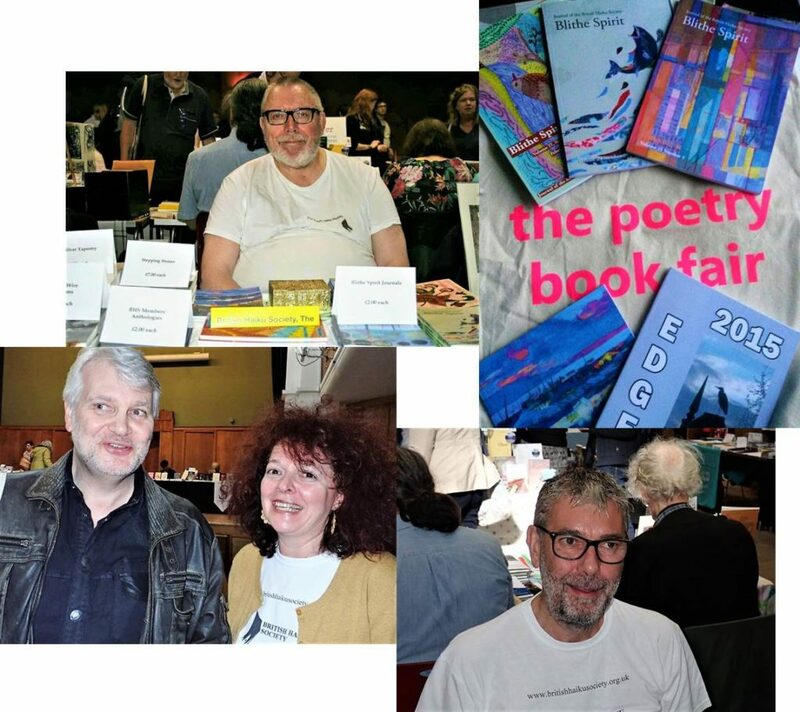 On the 30th of September 2017 for the third year running, the BHS had a table at the Poetry Book Fair at Conway Hall, London. The Fair was not as busy as last year, however thanks to the BBC documentary quite a few people stopped to talk to us at our stall and took leaflets. In total we made £46.00 from the sale of BHS books, anthologies, and Blithe Spirit copies. The pocket-size 2016 members’ anthology proved to be very popular. All in all we were successful in the BHS remit to outreach to the public. We hope to return again to the Poetry Fair next year. 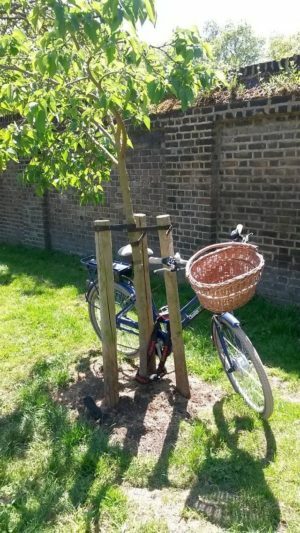 Many thanks to helpers, Kate B. Hall, Iliyana Stoyanova, Frank Williams and Mark Gilfillan who took turns in staffing the table throughout the day, and making it a success! 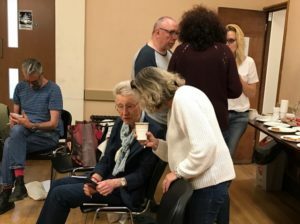 On 2nd July 2017, thirteen members of the London Haiku Group ran by Coordinator, Mark Gilfillan assembled for a meeting at the Royal Festival Hall. Each person brought along six poems for critiquing. A few months earlier it was agreed that the Group would produce an Anthology based on the poems brought along for critiquing. The Anthology would be edited by Frank Williams. From each person two poems were chosen by popular vote for inclusion in the project. We also welcomed two new people to the Group. Each person read out their poems and they were commented upon. The quality of work submitted was excellent, and showcased the wide variety of styles being produced, which added an extra interest and sparkle to the discussion. It is hoped that the Anthology will be finalised by the end of 2017. After the meeting a few members retired to the bar for refreshments and a general chat. The next meeting was scheduled for 3 September 2017 at the Royal Festival Hall, meeting at 12.45pm by the ticket office for a 1pm start.